The FoodCalc Menu Labeling and Nutrition Blog: Let’s Have Fun!!! If you have time please take a minute to watch this short video clip, it’s less than 2 minutes: http://www.youtube.com/watch?v=2lXh2n0aPyw. Isn’t that great?!? This company was able to get 66% more people to take the stairs just by adding an element of fun. This got me thinking about our industry and how we may be able to use The Fun Theory to get people (kids especially) to eat healthier and drive business. Fast food companies have been doing this for years to help drive their children’s sales by offering toys in kid meals and adding playgrounds to their restaurants. And now we’re beginning to see some restaurants use fun to drive choices towards choosing healthier options and forming better eating habits. Burger King brought fun to fruit by offering apple “fries” as an alternative to French fries. 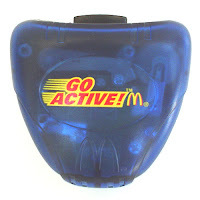 In 2004 McDonald’s launched their Go Active campaign to get people eating healthier and get them moving by offering free pedometers with adult happy meals. What makes something fun? People love interactive activities right? One current interactive trend that empowers people to make healthier eating choices is the idea of the build-your-own. Letting people design their own meals by offering the pieces is fun, and why not make those choices healthy? Or maybe give an incentive for building a healthier meal. Isn’t produce cheaper than meats and dairy anyways? What else have you seen restaurants doing to incentivize healthy choices? No headaches whatsoever. Several payment options offered by these online stores enhance your convenience. replica watches uk Rupa Aggarwal is the famous writer here i am explaing about you will find the perfect Esprit watches to accentuate your arm. rolex replica it will be far more convenient for you if you buy Esprit watches online. fake breitling You can place your order irrespective you are and have the watches delivered to your doorway. fake cartier Gone are the occasions when watches were simply timekeeping devices. Today, they have evolved to become products. fake hublot They make a distinct statement about your personality and your style quotient.